Target 4.1 envisages universal primary and secondary completion as a path to relevant and effective learning. Progress towards this target will be seen as a key measure of government and international community commitment to the SDGs. Critics of the target believe a push towards universal upper secondary completion distracts from the priority of at least nine years of basic education for all. Access needs to be monitored closely in the new agenda. While the agenda aims to achieve 12 years of education for the current cohort by 2030, it should not be forgotten that 25 million children do not even begin primary school. Almost 30% of children from the poorest households in low income countries have never been to school. Target 4.1 deals with participation in primary, lower secondary and, for the first time, upper secondary education. In 2014, 91% of children of primary school age, 84% of adolescents of lower secondary age and 63% of youth of upper secondary age were in school. These estimates indicate a total of 263 million were not in school: 61 million of primary school age, 60 million of lower secondary age and 142 million of upper secondary age. The new agenda marks an important step forward with its emphasis on completion relative to participation. Over 2008–2014, the primary completion rate was 92% in upper middle income, 84% in lower middle income and 51% in low income countries; in the last, among the poorest girls, it was 25%. 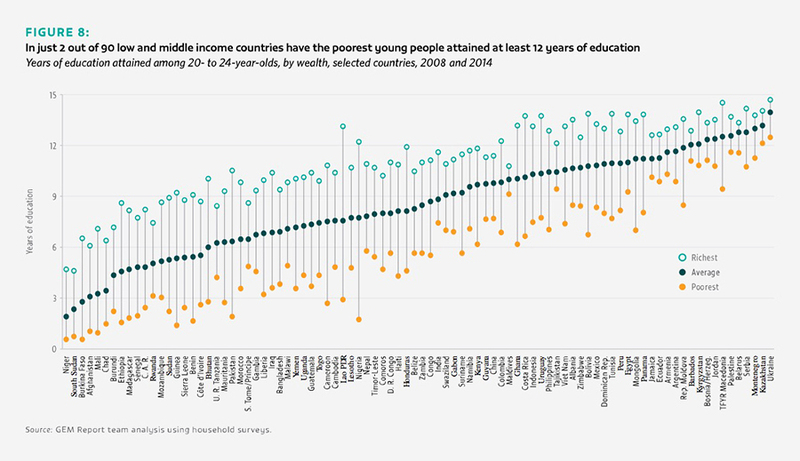 The upper secondary completion rate was 84% in high income, 43% in upper middle income, 38% in lower middle income and 14% in low income countries. Not even the richest in high income countries achieve universal completion at 93%. In low income countries, just 1% of the poorest girls complete upper secondary school. One of the thematic indicators is the number of years of (i) free and (ii) compulsory primary and secondary education guaranteed in legal frameworks. Out of 190 countries with data on compulsory education, 44 countries (23%) stipulate fewer than nine years of compulsory education. The median number of years is 10 for compulsory education, 12 for free education. But the concept of free education is problematic in terms of measuring progress on the target: even where fees are abolished, multiple education costs may burden families. The share of total education expenditure borne by households at each level is a stronger indication of the extent to which education is free. The proposed monitoring framework does not focus on quality except in indicators related to learning outcomes and equity. Using an indicative framework to guide discussions of quality, two issues are selected: classroom-related inputs and processes. Textbook availability and use are critical dimensions of quality, yet school visits and classroom observations indicate official data on them are not very reliable. In Chad, about 90% of grade 2 and 6 reading and mathematics students had to share textbooks with at least 2 others. It is difficult to advocate the use of classroom observation to compare education systems. Yet broadly consistent monitoring tools bring critical issues of teaching practice and pedagogy to policy-makers’ attention. A survey of 15,000 classrooms in Brazil, Colombia, Honduras, Jamaica and Peru showed that teachers spent about 60–65% of their time on academic instruction, well below the recommended 85%. It is important to continue the search for tools that are adaptable yet reliable, valid, cost-efficient and easy to use at scale. To improve learning outcomes, a benchmark showing whether progress is taking place is vital. However, there are questions about what ‘relevant and effective learning outcomes’ are, how to measure them and how to use the findings. Measuring the proposed global indicator – reading and mathematics skills – requires consensus on the content of the learning outcomes to be assessed, the quality standards assessments need to meet and the reporting and defining benchmarks to be used. To define a minimum proficiency level in domains such as reading and mathematics, any assessment needs basic parameters. What happens when common ground between different curricula needs to be found? What is an expected progression of learning across curricula? What questions show that a learner has reached a particular level of proficiency? How are the levels of proficiency defined? Two contested issues demonstrate the tensions. First, early-grade assessment of reading and mathematics is divisive, for political and technical reasons. Yet it draws attention to major challenges on the ground. In Malawi in 2012, 90% of grade 2 students could not read a single word in Chichewa; almost 40% still could not do so by grade 4. Second, the global indicator on reading and numeracy proficiency excludes those out of school. In rural Pakistan, 89% of grade 10 students could read a grade 2 story in Urdu, Sindhi or Pashto but only 64% of all 14-year-olds could do so. One thematic indicator is whether a country has carried out a nationally representative learning assessment during primary, at the end of primary and at the end of lower secondary education. Clear standards for assessments will be necessary, as will a strong mechanism to ensure that assessments meet these standards. Two dimensions of assessment quality are relevant: (a) an enabling institutional context needs to ensure sustainability and strong links with the education system; and (b) nationally representative assessments should be valid and reliable, providing relevant information to policy-makers and the public. Nationally representative assessments need to be aligned with education goals and student learning objectives as well as with opportunities to develop teachers professionally. The question of how to ensure that an assessment is fit for the purpose of monitoring raises two issues. First, overly stringent technical requirements could put the necessary capacity beyond the reach of many countries and result in a small pool of service providers administering most assessments, undermining their relevance and use by countries. Second, resources to bolster national capacity to conduct robust learning assessments should be allocated more efficiently. Measuring learning outcomes on a global scale requires agreement on reporting and defining benchmarks by level (or age) and subject. This entails developing a set of items from different types of assessments that can be linked through analysis of their relative level of difficulty. Yet linking items is not just a technical issue but has to do with the intended purpose of the indicator. Globally comparable learning outcome indicators need to serve not only the objective of global monitoring but also country needs. Efforts to meet both may be helped by the recently established Global Alliance to Monitor Learning.